It's pretty easy to tell where the cattle are. The grass is trimmed lower and just a few tall spots are around. Last week Homer discovered why one clump of grass had been left untouched when he mowed it and uncovered a nest of bald faced hornets, suspended between the high growing clumps. 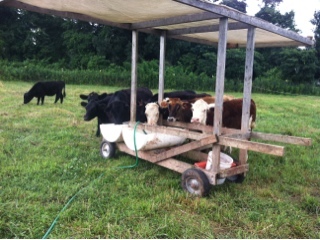 Cattle=smarter than we thought. The herd is looking fat and happy. There are plenty of good eats to select from out there. And where things are growing high a different sort of animal life is supported. 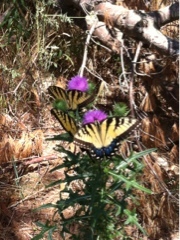 The swallowtails love it. As do the turkeys, who eat a plant like this down to the ground.